DARPA continues to develop an array of robots designed for the battlefield. Naturally, one of their slated applications is to chase human prey. 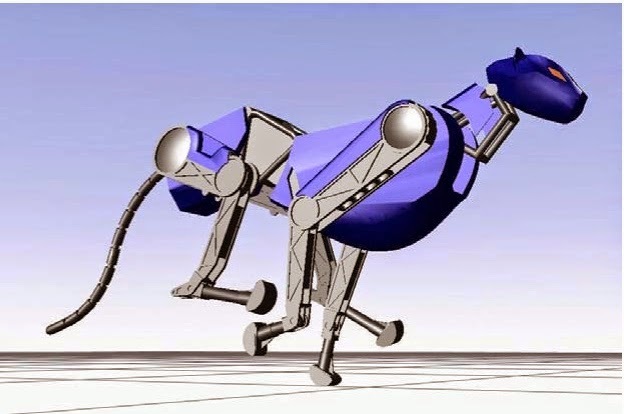 In February, 2011, DARPA first announced its next-generation robot called the Cheetah; it was heralded as the world's fastest legged robot. In fact, its speed of 28.3 mph was faster than the world's fastest man, Usain Bolt. However, its speed was reached in a laboratory setting, tethered on a treadmill for stability. MIT researchers are now announcing that they have solved the riddle which kept the Cheetah on its leash - the secret lies in a new computer algorithm that not only enables untethered running, but jumping as well.